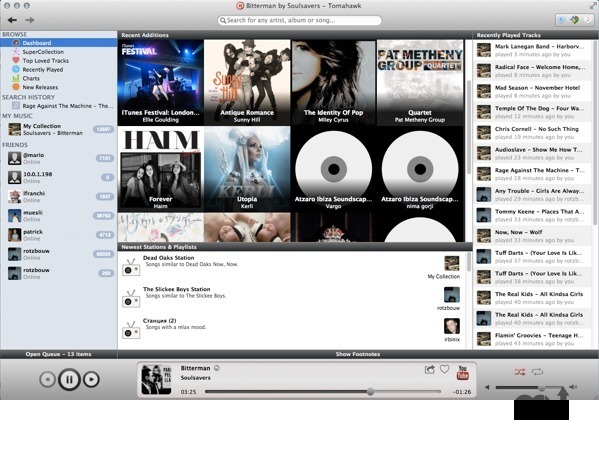 Consume and share music from multiple sources (beta). Is there a better alternative to Tomahawk? Is Tomahawk really the best app in Audio category? Will Tomahawk work good on macOS 10.13.4? Fixed drag-and-drop issues on sidebar. Fixed starting Tomahawk with a filename as parameter. Update column view when collection changes. Performance improvements for collection browsing. Show cloud collections above your friends in the sidebar. Keep looking for alternative sources even when we found a perfect match. Fixed crash in network code. Be more lenient about accepting JSPF and M3U playlists. Improved support for compilation albums. (Windows) Fixed support for Windows XP. (Linux) Don't crash on environments with invalid locales. (OS X) Fixed settings dialog appearance on OS X 10.10 Yosemite. (OS X) Fixed SSL errors on OS X 10.10 Yosemite.